After a successful 2016 season of serving boat charter needs of over 3,000 guests, Double Fun Watersports has announced the expansion of its fleet of pontoon boat charters in its Destin, Florida location. The addition of 8 new double-decker pontoon boats brings the total number of pontoons available for the 2017 season to 10. These new double-decker pontoon boats accommodate up to 12 passengers. The new 2016 and 2017 models in the fleet measure out to 30 feet in length and 10 feet in width. The boats are powered by a four-stroke Yamaha F115 gas motor. In addition to its design features, the new double-decker pontoon boat has several recreational options to keep passengers entertained while cruising the bay waters of the Gulf of Mexico or dropping anchor for a day at Crab Island. The top deck of the boat is recommended for lounging, sunbathing, and enjoying the two water-powered slides located near the stern. Ladders allow swimmers to easily climb onto the main deck when the pontoon is anchored. The main deck has a shaded area that can be used for picnicking and staying cool. A Bluetooth sound system is also available. The new double-decker pontoon boats also meet the standards established by the United States Coast Guard. Each boat is equipped with certified life jackets, radios, and emergency equipment. To further ensure passenger safety, those who charter are briefed on the boat's operation and licensure is required in certain circumstances. Fuel is provided by Double Fun Watersports. Double Fun Watersports’ 2017 season begins on March 1, and it will conclude on October 31. The company offers half-day and full-day charters. Discounts are available during the low season. 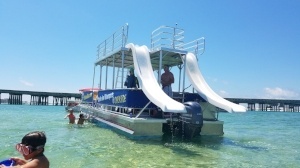 Double Fun Watersports is a boat charter company located in Destin, Florida and was the first to introduce the 20-passenger, double-decker pontoon boat with dual waterslides. Double Fun Watersports is owned and managed by the seasoned pros at Legacy Boating Club. The staff are experienced boaters who know the waters near Destin. For more information about Double Fun Watersports and its fleet of pontoon boat charters in Destin, contact us.